CIF STATE PLAYOFFS: The Aztecs dominate Hamilton to set up tonight’s showdown with Rolling Hills Prep. The boys of Ribet Academy also play for a trip to the finals. 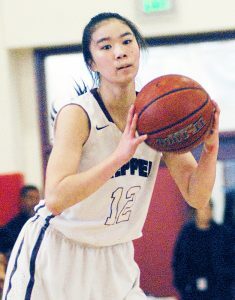 ALHAMBRA.–Mark Keppel assistant coach Sydne Kaku was reminded of an exhibition game played back in 2016, during her senior season with the Lady Aztecs. Keppel had won three straight Almont League titles and were arguably the best team in the area. They welcomed the Tokyo City champions from Yakumo Academy, for what was expected to be a friendly matchup of two superb teams. What transpired was more like the Harlem Globetrotters versus the local YMCA pickup club. The girls from Japan played amazingly efficient basketball, characterized by crisp passing, almost zero dribbling on the offensive end, and beat Keppel 100-36. If Kaku’s memory of that day has faded a bit, last Saturday’s CIF State Div. II Regional semifinal against Hamilton might have served as a refresher. This time, it was Keppel firing on all cylinders, dominating basically every aspect of the game and running away with a 72-42 victory. For a stunned Hamilton team, it was almost as if the ghost of Aaron Burr had possessed their opponents. Keppel flew out of the gate, jumping to a quick 11-2 lead in the first period, using quickness and stifling defense to push the taller, stronger Yankees completely off their game plan. By the end of the period, the gap had narrowed to seven points, but that was Hamilton’s last real look at the match. The onslaught gained speed in the second, as the game must have seemed to Hamilton’s players like an endless barrage of hands in faces, never affording them a good look at the basket. 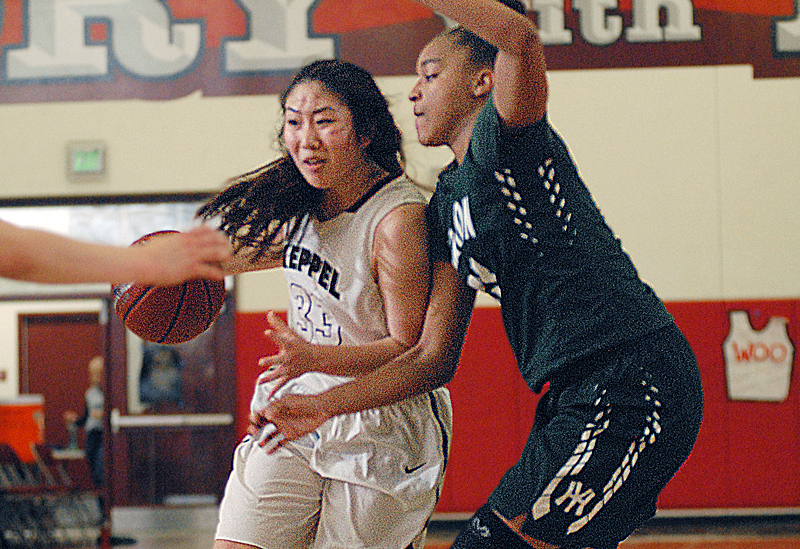 Keppel dominated on rebounds, six by their fantastic senior Vanessa Aguirre, who finished with 18 points. Along with the scoring of Mia Heidt, Patricia Chung and Cassandra Shimada, the Aztecs went on a 13-0 run and by halftime had a solid 33-18 lead. Senior forward Aimi Woo finished with two points and three assists. So in control was Keppel, that at one stretch, Hamilton went more than three and half minutes without so much as attempting a shot. At another point, the Yankees failed to get the ball to their offensive end for almost a minute and a half. Despite the complete control his team had over the contest, Keppel head coach Jose Herrera saw something he didn’t like. Calling a full timeout in the third quarter, the normally calm Herrera made his displeasure known to his players in no uncertain terms. Shimada scored 10 points, Catherine Dea had 11, and Chung, who sat for much of the second half, finished with six. Hamilton’s talented forward Kennedee Rankin led the Yankees with 11 points. With the lead approaching 40 points, Herrera began putting his bench into action, to get valuable playoff experience. Among those benefitting from the extra minutes was frosh Jennifer Nitta, whose teammates looked to get her ball as often as practical. Nitta sank two of six three-point attempts and admitted she was nervous in her first postseason appearance. Also getting some important playing time was senior Aimi Woo, who finished with two points and three assists. “As far as I think, my job is to score as much as I can while I’m in there, to try and help the team,” she said. Woo said a valuable part of the team’s training has been playing scrimmages against the Keppel boys’ team, and gave praise to team advisor Yasunori Oda’s technical advice. “He sees a lot,” Woo said. Tonight’s Southern Regional regional final promises to be a classic, as the Lady Aztecs will face Rolling Hills Prep, with a trip to Sacramento and the State finals on the line. In what was become a mostly successful pattern, the Huskies erased a halftime deficit and survived their battle with Eastvale Roosevelt, 62-61. Madison Yamada had key steals and a crucial three-pointer late in the game, and Alyssa Maxey finished 18 points for the Huskies. Junior Naya Stroud, who felt the sting of missing two free throws at the end of RHP’s one-point loss in the Southern Section final, stepped up and sank two key foul shots to help secure the victory on Saturday. A dream season for 6-foot-9 Yuuto Williams and Ribet Academy continues tonight, as the Fighting Frogs will vie for a berth to the Div. IV State Finals. Ribet handled Fremont on Saturday, 60-49, extending its winning streak to 23 games. They will host Silverado of Victorville tonight in Glassell Park.